About N@MH | Not At My House! 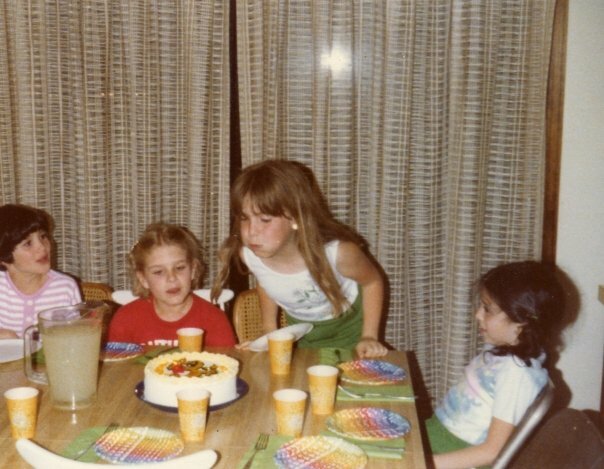 Growing up in the 1970’s and 80’s, birthday parties were generally low-key, at-home events. A handful of friends would come over on a Saturday afternoon. We’d pin the tail on the donkey, kick the can, sing Happy Birthday, and eat cake. Sometimes we’d sleep over, French-braiding our hair while watching Fantasy Island. Inevitably someone, usually the birthday kid, would end up crying. But, generally, a good time would be had by all until it was time to clean up. Back then, party accessories, like pantyhose, were similarly no-nonsense. My mom took me to the Hallmark store to choose fill-in-the-blank invitations, which I completed with a purple metallic pen. She’d pick up rainbow paper goods from the back of the same store. Sometimes she’d order a Carvel cake, but other years she’d stay up late to create a Baker’s coconut cut-up-cake masterpiece or jelly-bean rainbow extravaganza. Guests are exhausted by paparazzi. but dazzled by homemade rainbow cake. Following that tradition, for my son’s first birthday party, I planned a small family gathering at our house. My dyed, shredded coconut gene activated, and I pulled an all-nighter to create a Sesame Street-themed cake. He woke up with a runny nose and was freaked out by the singing, but the party was generally successful. As our social circle expanded, and my son’s activity level skyrocketed, I realized that we didn’t have the space, nor did I have the temperament, for a second birthday party at home with a dozen toddlers and their chaperones. We decided to hold the bash at a local kiddie gym, but I couldn’t resist making the cake. As we added another kid, we continued to throw parties elsewhere, but to create the cake (and later, invitations) at home. Since my kids’ birthdays are seasons apart, I’ve had the time to explore various ways to add homemade flair to an otherwise-outsourced affair. This blog will chronicle these creations; please, take these ideas, improve on them, and keep me posted.